by Chris Woodford. Last updated: October 14, 2018. No more candles, no more gas lamps—just imagine how amazing people found the very first practical electric lamps toward the end of the 19th century. Incandescent lamps (ones that make light by making heat) are getting something of a bad press these days because they waste so much energy, but they've long been considered among the greatest inventions of all time and a burning-bright light bulb is still widely used as the symbol of a great idea. Let's take a look at these marvels of technology and find out how they work! Photo: We take electric light for granted in the 21st century, but it was a jaw-dropping spectacle when it first became widely available. 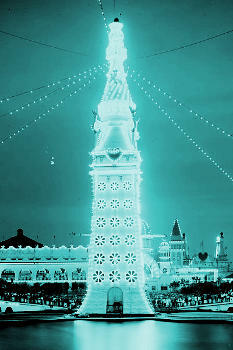 This 60m (200ft) tall Electric Tower at Luna Park, Coney Island, New York was made from 20,000 incandescent lamps and drew huge crowds in the early years of the 20th century. Detail from a 1903 photo by Detroit Publishing Co. courtesy of US Library of Congress. 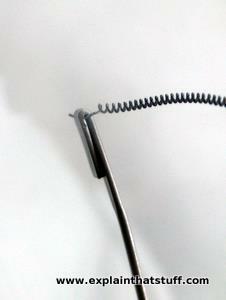 Photo: An incandescent lamp makes light by passing electricity through a very thin wire filament. The filament gets red or white hot and gives off light (as well as lots of heat). You can see the filament clearly as a bright white stripe in this short-exposure photograph. Set fire to a big bunch of logs and you'll get a nice red glow as well as a warm feeling. People have known that hot things give off light ever since the discovery of fire, somewhere between one and two million years ago. But just why do hot things give off light? Candles used to be our main way of making light from heat. A candle is a mini-chemical factory that produces a continuous flame by slowly converting the energy stored in its oily wax into heat and light. A basic law of physics called the conservation of energy tells us exactly why candles always burn out eventually: all the energy we need to make continuous candlelight has to come from the wax, which must slowly burn away. Now just imagine if you could make a candle that never burned out—one that never needed replacing. You'd need a flame that never died and an endless supply of energy. And that's pretty much what you have in an incandescent electric light. 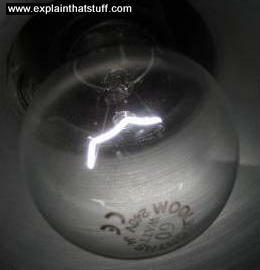 Why do incandescent lamps glow when electricity flow through them? Electricity flows better through some materials than others. Metals that let electricity flow easily are good conductors that have low electrical resistance; plastics, wood, and other insulators have a high resistance. Some metals are better conductors than others: silver is better than gold, gold is better than copper, and copper is better than aluminum. Not all conductors are metals, however. Carbon is a good conductor and it has little in common with most metals. Photo: A modern, electric incandescent lamp. The filament is a length of tightly coiled tungsten metal stretched between two terminals that let the current flow through it. Photo: Zooming in closer on the previous photo: You can clearly see the coils in the filament in this shot. Take a piece of a conducting material and you can make electricity flow through it a little bit better by doing two things: first, by making it shorter (the longer your conductor, the more work electricity has to do to get through it); second, by making it thicker (the fatter the conductor, the easier it is for the electric current to flow). Now suppose you could make a conductor that's both short and thin and pass electricity through it. Fashion it just right and it'll have enough resistance to make the current work hard and not so much that it stops the current completely. Switch on the electric current and your conductor (which is usually called a filament) will heat up. Use enough electricity and the filament will heat up so much that it'll glow red or white hot and give off light. That's the basic idea behind the incandescent electric light. The only trouble is that an incandescent lamp has to produce an incredible amount of heat to make a decent amount of light. Roughly 95 percent of the electricity you feed into a lamp like this is wasted as heat. That's why people are now so keen on switching away from incandescent technology to energy-saving lamps (compact fluorescent lamps, also known as CFLs, or LEDs), which last several times longer and save roughly 80 percent of the energy (a typical incandescent lasts only about 1000 hours—from a few months to a year or two depending on how much you use it). Artwork: Reinventing the filament lamp. Unlike other electrical appliances, light bulbs often have no fuse inside them. If the filament burns out or breaks, it can produce a dangerous arc that causes the glass to explode. In the 1950s, Samuel Gray, John Fellows, and Robert Reed of Sylvania invented this bulb with a built-in fuse to get around the problem. As with a basic lamp, there's a filament (1, yellow) and electrical terminals (2, red) connecting it to the power supply. But in one of the terminals, there's also a simple fuse (3. blue) that will simply burn out if the current becomes too great, giving greater protection than an ordinary, unfused bulb. Artwork courtesy of US Patent and Trademark Office, from US Patent 2,859,381: Fuse for incandescent lamp. The glowing filament is obviously the most important bit of a lamp like this—but by no means the only interesting part. The glass bulb itself isn't filled with air, as you might expect, but something that makes it hard for the filament to burn (such as nitrogen or argon), which greatly extends its life. In a lot of lamps, it's actually impossible to see the gas, the filament, or anything else, because the glass is completely frosted. That's to prevent glare, effectively by diffusing the pinpoint brightness of the filament over a much bigger area. The fitting is another important feature. In some countries, screw-in (Edison screw, ES) bulbs are commonplace; elsewhere, bayonet fittings (with two prongs holding the bulb into the holder) are more popular. Two of the best features of incandescent lamps stem directly from Edison's own design. First, because lamps like this contain little more than a filament, a glass bulb, and a metal base, they're very cheap to manufacture and purchase. Second, the brightness of an incandescent lamp is directly related to the size of the electric current zipping through the filament. That means it's relatively simple to make a range of bulbs of different brightness (such as 40W, 60W, 100W and so on), but also to make bulbs that can be dimmed. Who invented the electric lamp? 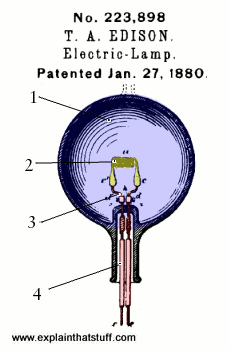 Artwork: Thomas Edison's original 1880 electric lamp patent, courtesy of the US Patent and Trademark Office. I've colored and labeled it to show four of the key parts: 1) Glass bulb from which the air has been removed; 2) Coiled filament; 3) Wires connected to filament; 4) Connections running outside bulb to electricity supply. Most people associate American Thomas Edison (1847–1931) with the electric filament lamp, but he wasn't solely responsible for what was arguably one of the greatest inventions of all time. Edison's electric lamp built on a number of earlier inventions including the electric arc lamp, developed in the early 19th century, which worked by buzzing high-voltage electricity between two carbon rods to make continuous bright sparks of light. The trouble with arc lamps was that the carbon rods quickly burned up in the air, so they had to be regularly replaced. Imagine having to change your light bulbs after only a few days—or even hours! Edison's great contribution was to make a much longer-lasting and more practical lamp. In his inventing laboratory at Menlo Park in New Jersey, he tested something like 6,000 different materials—including red hair—before discovering that bamboo coated with carbon was the best thing to use as a filament. He sealed his filament inside a vacuum using a glass bulb from which the air had been removed, figuring correctly that the lack of air would prevent the filament from burning up too rapidly. Edison patented his light in 1880, around the same time as a rival design developed by an Englishman named Joseph Swan (1828–1914). After a short dispute, the two men decided to work together and sold the invention jointly from 1883 under the name of the Edison and Swan United Electric Light Company. "The object of this invention is to produce electric lamps giving light by incandescence, which lamps shall have high resistance, so as to allow of the practical subdivision of the electric light. The invention consists in a light-giving body of carbon wire or sheets coiled or arranged in such a manner as to offer great resistance to the passage of the electric current, and at the same time present but a slight surface from which radiation can take place. The invention further consists in placing such burner of great resistance in a nearly perfect vacuum to prevent oxidation and injury to the conductor by the atmosphere..."
If you're interested, read for yourself Edison's original US Patent 223,898: Electric lamp (via Google Patents). 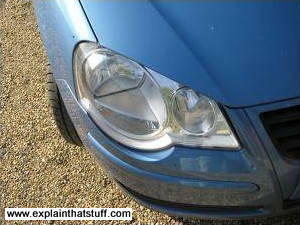 Photo: This car's headlamps are fitted with super-bright halogen bulbs. In a halogen lamp, the bulb is filled with a noble gas such as krypton or xenon, plus a tiny amount of a halogen gas such as iodine or bromine, which is at a higher temperature and pressure than in a normal bulb. The halogen constantly regenerates the tungsten filament, effectively "bouncing back" tungsten atoms to rebuild the filament when it starts to disintegrate. This means the filament lasts much longer than it does in a normal lamp. The temperature of a halogen lamp (typically 250–600°C or 480–1100°F) is plenty hot enough for cooking food, which is why you'll find these things inside some ceramic cooktops (hobs). They cook mostly by beaming infrared radiation up into your pan, though since the cooktop gets hot, there's also some direct heating by conduction as well. Animation: How a tungsten halogen lamp works: 1) Tungsten atoms (yellow) vaporize from the filament and would normally deposit on the inside of the glass. 2) In a halogen bulb, halogen atoms (red) combine with the tungsten atoms, forming a tungsten halide gas (blue rectangles). 3) This halide moves around until it nears the high-temperature filament, when it splits apart. The tungsten atoms return to the filament and help to regenerate it; the halogens become available for trapping and "recycling" more tungsten atoms. The Age of Edison: Electric Light and the Invention of Modern America by Ernest Freeberg. Penguin, 2013. How big a part did Edison's invention play in the development of modern, urban America? Edison's Electric Light: The Art of Invention by Robert Friedel, Paul Israel, and Bernard S. Finn. Johns Hopkins University Press, 2010. Explores the process of invention using Edison's light as the example. Draws on considerable material from Edison's notes and archives. The Wizard of Menlo Park: How Thomas Alva Edison Invented the Modern World by Randall E. Stross. Crown Publishing Group, 2008. I enjoyed this alternative view of Edison's life; it's a kind of "reinvention" of the light-bulb pioneer, painting him as a much more flawed genius than the conventional biographies. Thomas Edison by Kay Banham. Raintree, 2015. A 32-page biography for ages 8–10 with double-page spreads covering key inventions or periods in Edison's life. DK Biographies: Thomas Edison by Jan Adkins. DK, 2009. A well-illustrated, curriculum linked, short biography for younger readers aged 9–12. Inventing the Electric Light by Lisa Mullins. Crabtree Publishing Company, 2007. A simple account of the early years of electric light, including how the work of Edison and Swan built on earlier electricity research by figures such as Benjamin Franklin. Ages 8–10. Kissing Edison's Light Bulb Goodbye by James Kanter. The New York Times, March 18, 2009. How greater environmental awareness made Edison's invention obsolete. 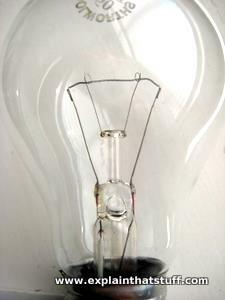 Edison Bulb Turns 100; Research Flourishes by Culver Picmes. The New York Times, February 6, 1979. An article from the Times archive celebrates a century of Edison incandescent light. It's interesting that the efficiency drawbacks don't merit a mention, even though the 1970s was the first properly eco-conscious decade.